Not just a gorgeous printed beach towel! 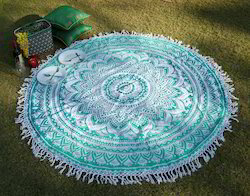 But also can be used as Beach Mat/ Towel/ Blanket, Carpet, Picnic Blanket, Bed Cover, Yoga Mat, Table Cover, Watch Outdoor Movies, Window Curtain and of course as a Tapestry or Wall hanging or Decor or Throw Beach, College Dorm Bedspread, park picnics, yoga & meditation & poolside lounging. You can even use as a camp side blanket around the bonfire or even just as a beautiful throw or bohemian tapestry for your indoor décor.